Enterprise adoption of IaaS environments has brought tremendous benefits, in terms of cost savings and agility, and enabled a more dynamic infrastructure. However, these changes have created new security, compliance, and IT administration challenges for enterprises, and management challenges for cloud service providers. 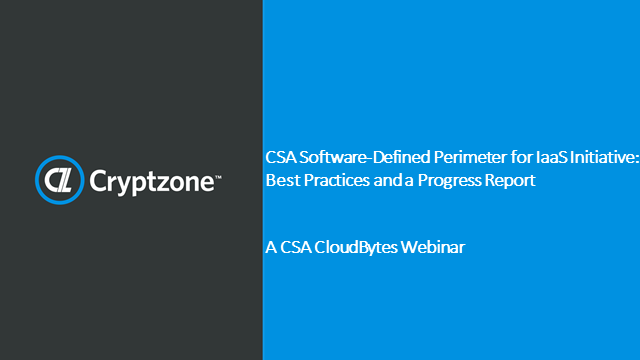 The good news is that a Software-Defined Perimeter (SDP) approach can solve these problems. SDP can better protect IaaS services for Enterprise usage, and deliver uniform and seamless protection of on-premises and IaaS resources. In this webinar, Jason Garbis, Cryptzone’s VP Products, and IaaS Initiative Workgroup Chair, will provide a progress report from the new IaaS SDP Working Group initiative and an update on how SDP can uniquely address these problems for IaaS. Whether you’re with a cloud provider looking to improve management capabilities, or an enterprise that wants to bolster IaaS security initiatives, you’ll want to tune in.